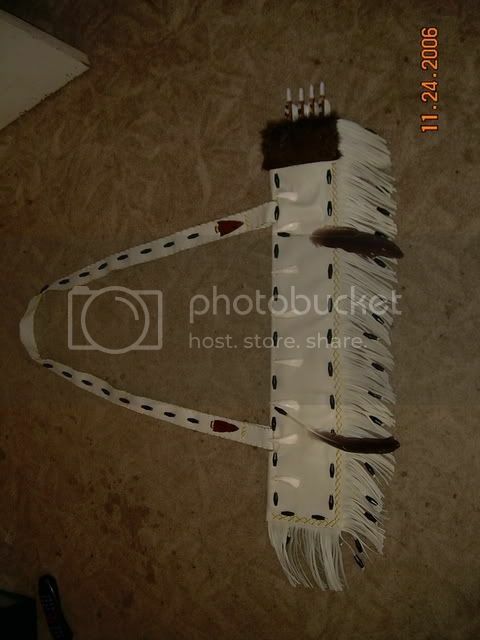 Re: Lakota quiver build-a-long! COMPLETE! 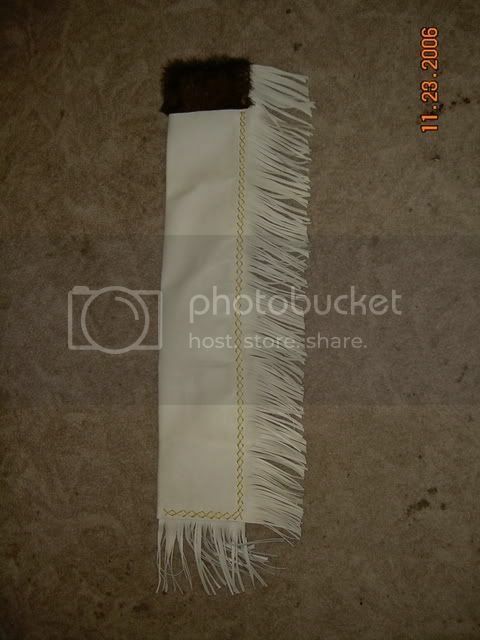 The fringe is cut, next we move to the strap notches. Here is a picture of it so far. "I would rather be lucky then good, any day!" Now for the strap notches, I measure in 5 1/2" from each end. Here I put a small mark. Then Measure 2 inches to the inside of each mark and put another mark, Measure down 1/2" Connect your marks and cut this area out. This will leave room for our 2" strap later on. Punch a single row of holes along side the long side of the cut, and stitch it up. I start from the back go through the leather then back over the edge and come through the back again. I also put a drop of duco on the knots so they don't come untied. It should be similar to this. Next take a 3/8 dowwel rod or an arrow shaft and stain it and taper one end. Insert the rod inside the quiver going above the stitches you just put in. This is a pretty snug fit but twist it as you slide it in and it will go. 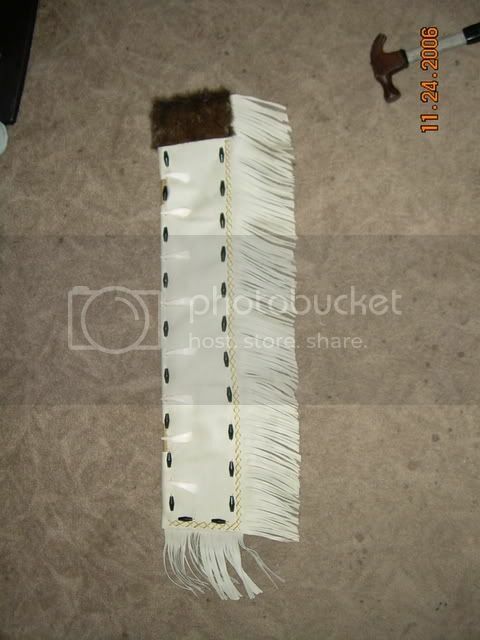 Once it is in all the way, Mark the end sticking out even with the fur trim. Then slide it back out a couple inches, cut the dowell at the mark then slide it back in. Next I'm putting a row of black hairpipe beads (1") and some buffalo teeth on. I just punch the holes as I lay these out so that it all matches up. And sew them on with artificial sinew. Tomorrow I'll make a strap for it and put a few finishing touches on. Were almost there! Nice work. Keep it comming. 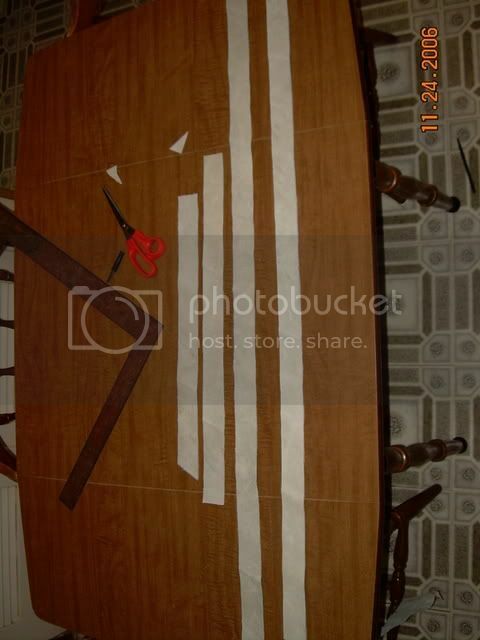 Now, it is time to begin cutting pieces for the strap. As I do not have any pieces long enough to make the strap from one single piece I'm going to cut several pieces and splice them together. These will also be doubled up in thickness. I like a strap around 68" long, and 1 1/2" wide. Here are the pieces cut out. next apply contact cement to the pieces (on the back side) and start putting them together. I normaly overlap the pieces at least 6" when doing this. 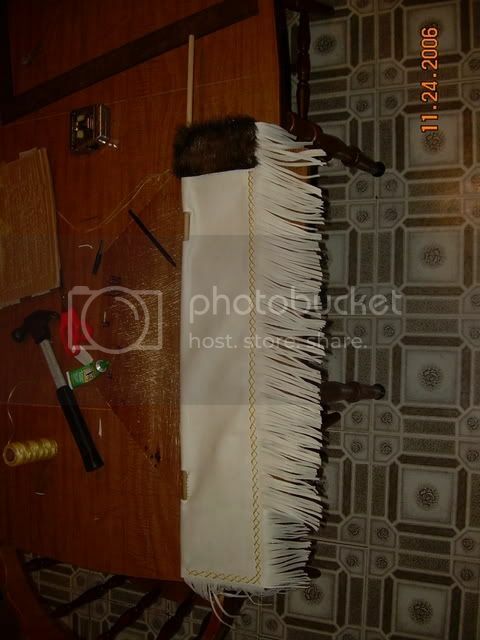 Make sure the finished side of the leather is facing out on both sides!. Once thats done let it dry for a bit then punch a single row of holes about 1/8" in from the edge around the whole thing. Then take your artifical sinew and begin stitching it up. Just run your needle through the holes on one side then go over the edge and back through the same side you started on. Make sure you also stitch across the spliced areas! You can use a cross stitch for that to make it look nice. 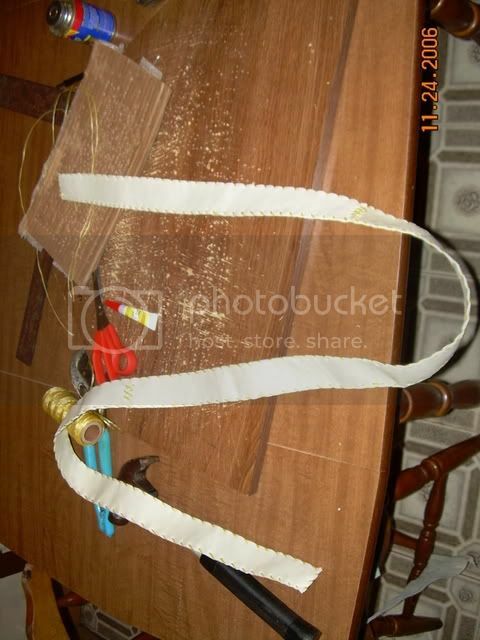 Once again put a drop of glue on all the knots. Heres a picture of it glued up and stitched. Now slide it through the notches we cut on the quiver going under our dowell stiffening rod. Go through the front first so that the end is hid behind the main strap. Then punch a double row of holes and cross stitch it together. Repeat for the other end. 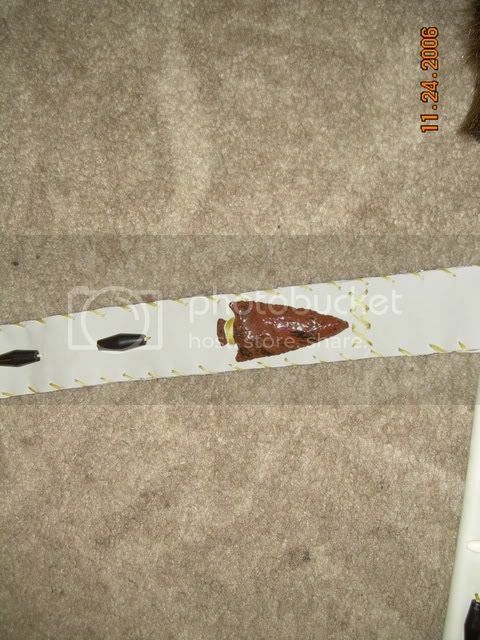 Here's a close up of the strap going on the quiver and holes being punched. And here it is with our strap attached. and a few beads added to the fringe, I put these about every 4 or 5 inches because I don't want them to be able to touch each other and rattle. Next we put on a few finishing touches! Now for a few finishing touches. First I am going to Attach an obsidian head I knapped to each end of the strap. I simply punched a couple holes and ran sinew around the head. I knapped these on thanksgiving for just this purpose there a nice mahogany with black flake. 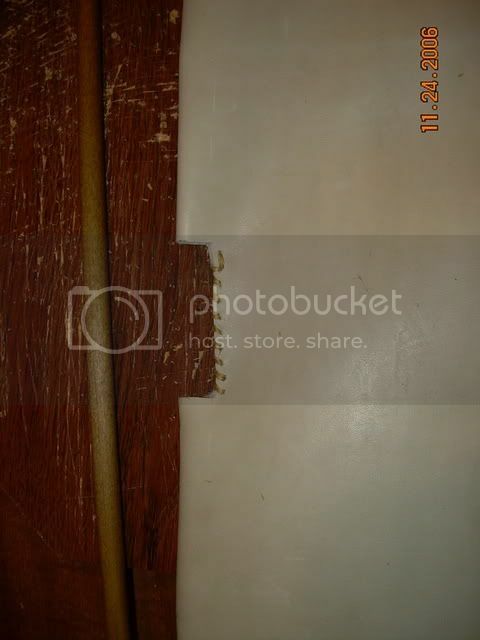 Then we will run a row of 1" black hairpipe beads along the legnth of the strap with 1" spaces inbetween. And last but not least, I attached a pair of goose wing feathers along the body with a legnth os artifical sinew! 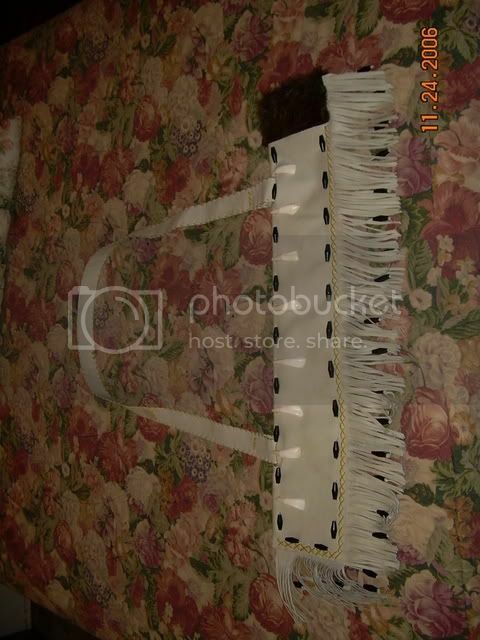 This picture is of the beads and head on one end of the strap. 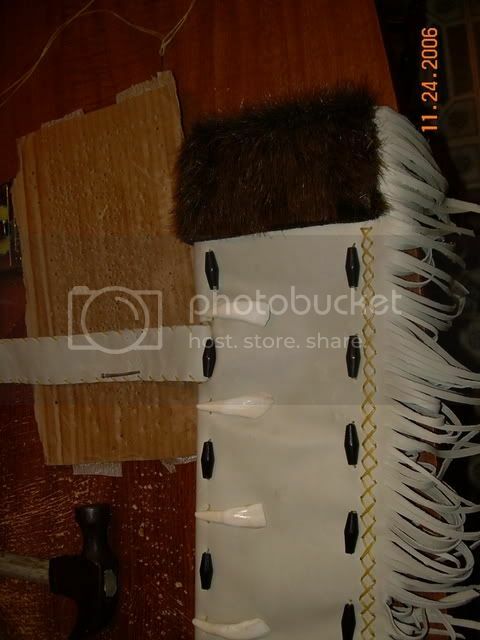 And here is our finished quiver with 4 arrows inside. Theres room for maybe 5 max. one more taken outside with the help of my 5 year old Arron where the lights better! All thats left is to drop this in the mail heading for a fellow tradganger, Houska. Adeeden, I asked for this build-along and I want you to know that I appreciate it very much. I'll be saving this in my own archives, and intend to print it out for more study. I fully realize how much work goes into a project like this, and you have done this one in exemplary fashion. Thank you again. - Roy. This was fantastic. Thank you very much for doing this. The quiver looks great, I can't wait to give it a try. It wil be perfect for my small game hunts I have planned for after deer season. I will send you some photos of the hunts. Once again thanks and I will be sending you a gift for this gift. Take care and thanks for going above and beyond what was expected. I'll get it in the mail on Monday, And thanks for the kind words! Where did you get your supplies like the buffalo teeth and the beads? I get my beads from netbeads.com The buffalo teeth I got in trade for some knapping supplies, but if you do a search online there pretty easy to find. Also most craftstores (Hobby lobby) carry big assortments of beads. Mike, I got mine from a local upholsterer. 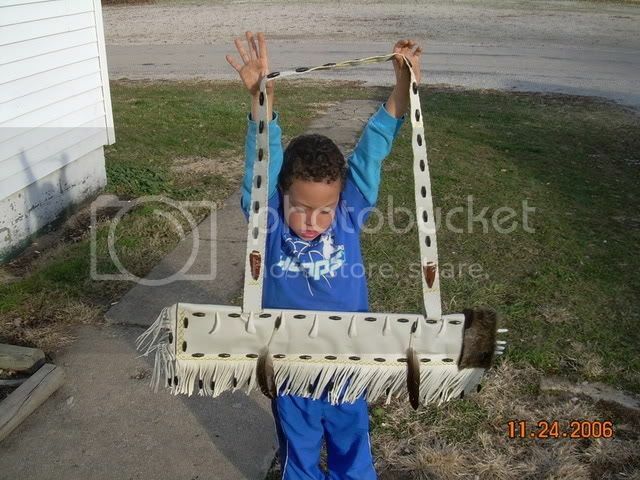 He sold me his "scraps" for $10 and I had enough to do two quivers.